I just read about this Alaskan string orchestra. They are playing a concert next week. Back when our kids were little, we used to get a book out of the library that had, as one its characters, a bird that would fly far and wide searching for its own kind. My family knew that I identified with that bird, and they even used to kid me about it. While I was growing up I never "fit in." I wanted to find people who shared my interests and attitudes, but I was often disappointed when they thought of me as "odd" or "other," or simply too difficult to deal with. Perhaps that is why I stopped doing facebook: it is too personally painful to look back and, once again, feel like an outsider (though, in retrospect, I imagine it was often by choice). It is not that I am a snob. I am functionally social, and have conversations with neighbors I meet in the store and people who go to concerts. I also try to keep up with local and non-local happenings, both musical and non-musical. I do have friends, but, perhaps out of self-preservation (and also out of impossibility), they tend not to be like me. They also tend to live in other places. When I was a young adult I had the opportunity to leave my life and language behind and build a whole new life from scratch in a new country and speaking a new language. The first several months were filled with wonderful adventures: even the most mundane tasks were fascinating, and even the most uninteresting people were fascinating because everything I talked about with them was in my unschooled German. The excitement faded, however, when my German became functional enough to say pretty much the same things I would say in English. I was faced, once again, with myself. Dragging that self along with me through the various stages of my life that I have enjoyed since I stopped living it in German, has finally become kind of fun. I have come to like the person I have grown into, and, perhaps, I would be really freaked out if I were to meet someone now who happened, in this world of zillions of people, to be just like me. Still, occasionally, I find myself on the lookout for another of my own kind. While casually moving through the internets, I happened upon a person who shares my name. She is a painter in England, and her paintings seem to share some of the properties of some of the music I write. My own kind? I highly doubt it, but it is still interesting to contemplate the idea. Vibrato is caused when the air flow exceeds the resistance of the folds. The Hagen-Poiseuille Law references that when the airflow becomes greater than the resistance of the conduit, laminar flow is terminated and turbulent flow begins. The trachea terminates as a conduit when the vocal folds come into play. Please understand there is a difference in the definition of the gas law and the physiologic application of the gas law. So much for not using vibrato in baroque music, huh? Vibrato is not just a good idea. Like gravity, it's the law. Last night Michael and I were driving through the East-Central Illinois fog, listening to the syndicated radio program "Radio Deluxe," hosted by John Pizzarelli and Jessica Molaskey. The program presents the aural illusion of being broadcast from a penthouse on Lexington Avenue in New York (though the program is produced on the west coast), and claims to feature what people like to refer to as the "Great American Songbook." The hosts sure spend a great deal of time making sure the audience knows who they are, but last night they neglected to give what would have been some much-appreciated information about the music they were playing. They played, among other things, a recorded performance of "Oh Well" from Leonard Bernstein's On The Town (the 1944 stage production--the song never made it into the movie) by Tony Bennett and Bill Evans. Michael noticed that Evans was substituting the chords from his "Peace Piece" in his accompaniment (the chord progression is also used in "Flamenco Sketches" on Miles Davis' Kind of Blue). I knew the song as a Bernstein duet, and appreciated Evans' extended harmonies, but didn't recognize them as belonging to another piece (or two). Michael knows a lot of things that I don't know (so reader, I married him), but he didn't know that the song was written by Leonard Bernstein. Though Pizzarelli and Molaskey waxed on and on about what a well-written song it was, they didn't even mention the name of the composer, or that the lyrics were by Betty Comden and Adolph Green. Pizzarelli and Molasky also mentioned nothing about Evans' harmonic interpretation of the song. With all the information available at the touch of a button, why do these people (who are musicians themselves) feel that it is acceptable to give so little information about the music they play? Who do they think their audience is? Perhaps Michael and I should start broadcasting radio programs from our 1996 Corolla. We could call it Corolla Deluxe. György Cziffra's performance of Liszt's Gnomenreigen is really sensational, but today, on a lark, I also shared this performance by the eight-year-old Umi Garrett (who has been playing the piano for four years) with my classes. Unlike many of the very young pianists I have heard play "big" repertoire, this one really has something far beyond precision and cuteness. It won't be long before she has the strength of Cziffra, and I intend to keep an eye (and an ear) on her. I thought I'd share this video here. You can see and hear more here. La Folia, that is. This website gives information about every known setting of the famous tune, and even goes out on a limb to suggest that Beethoven stuck a Folia between measures 166 through 173 of the the second movement of his Fifth Symphony. The page is certainly worth exploring, particularly the nifty chronological map. There has been a lot of blog-talk on the internet concerning the ebbs and flows of what people call "classical music," which is really more a reflection of the business of classical music as reflected in ways of measuring its popularity in financial terms. Writers look at the musical world from where they sit, and watch it march by and change, while they, either seeking to participate in the moments of "upswing," or trying to make their case for viable alternatives to "tradition," attempt to find something that resembles temporary truth. The problem is that there are so many exceptions to all rules in the world of creativity, particularly musical creativity, that it is impossible to see the musical world from one spot. We live in a world where people try to chronicle history as it is happening, and that same desire to chronicle events that might one day be considered historical, is at play in the people who write about music. I'm just as guilty as the rest of the bunch. I see musical history through a slightly different lens from anyone else because of my experience. You see musical history through a slightly different lens from anyone else because of your experience. Norman Lebrecht sold a lot of books because of his observations from his insider position, and falsely (but eloquently) pronounced classical music dead. He was talking about the classical music business as he knew it. Classical music as I know it is not dead. It is something that takes up the majority of my time, heart, and soul. There are just as many young people who have feelings about music that are similar to the feelings I have as there were when I was a young person. The fact that there are now exponentially more musicians than there are jobs for them doesn't seem to deter them from being musicians, even if they don't end up doing it for their livelihoods. I used to bemoan change. I used to insist that people don't play "the way they used to." Now I entertain the idea that maybe people who try to play the way "they used to" are, perhaps, not being true to who they are as people. We have been fortunate as a culture (and I do believe that it is correct to talk about the musical culture in the collective sense, even if not everybody participates in it) to have recordings and films that show us music making that is truly great. It is certainly possible (given ample instrumental technique) to try to imitate what we experience as musical greatness--to attempt to capture the surface of what Milstein does, or what Heifetz does (I say does, because while we listen and watch it is happening in the now for us), what Richter does, what Arrau does, what Fritz Wunderlich does, and what a long list of other great musicians do. What is not possible is to imitate the life experience and the particularly musical intelligence, hard won through discipline and struggle, that serves as the backbone of what blooms on the surface. I personally don't want the struggles of the past. I don't want to deal with the narrow-minded attitudes and loss of personal as well as musical freedom that musicians who were Jewish had to contend with during the first half of the 20th century. I don't want to deal with attitudes that women, both as performing musicians and as composers, were inferior to men (with a few exceptions held by the more generous). I don't want to deal with narrow-minded attitudes towards race that still get in the way of cultural development, but have improved a great deal in the world of classical music during my lifetime. There have always been people who know how to treat classical music as a commodity. There are recording companies like Naxos that have taken advantage of the global market for classical music, and have done extremely well--expanding far beyond even their wildest dreams. I watched it from the beginning. I have seen it change. I haven't heard anybody complain. There are people who buy their classical music recordings the way they buy designer clothes, shoes, or purses. It all has to do with the promotion. Those people have always been there: buying Rampal and Galway flute recordings in the 1970s and 80s, buying well-marketed recordings (sometimes even "crossover" recordings) of Yo-Yo Ma and Thomas Hampson, as well as a whole stable of attractive and competent (and often very good) performing musicians who make a lot of money from appearing as soloists. There are always people who will go to the "symphony" for the enjoyment of the whole experience: dressing up, going with friends, hearing something they might know, or something new, and seeing other "like-minded" people to schmooze with. Audience schmoozing is one of the side benefits from going to concerts, and I believe that it always has been. And there are audiences everywhere--not just in big cities, where many of the cultural critics live. I could go on, but I have a rehearsal. This morning we are reading a pile of new-old music for a concert in March of music written by women. There is enough music available now (from many eras) that we get to pick and choose! Now that's progress! I have been reading a bit about Felix Mendelssohn's inadequate feelings about his Fourth Symphony, and how they mystified critics, like Donald Francis Tovey, who considered it a most perfect piece of music. I think that the answer is that Mendelssohn's feelings of inadequacy are simply on a higher level than the feelings of inadequacy enjoyed by most composers and most critics (particularly people like Tovey who were both). It is a little bit like the charming intel commercial that has been circulating on line. Mendelssohn was a conductor who held Bach, Mozart, and Beethoven as his ideal composers. But Mendelssohn was working in a different time, and his music demanded different harmonic configurations. Some of his harmonic configurations and modulations are difficult for an orchestra to get the first time (or the second, or the third), and some of his string parts (particularly the viola part of this piece, which I am playing) are downright uncomfortable to play for those same harmonic reasons. 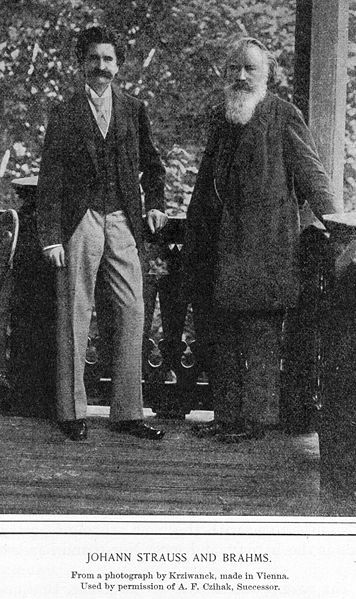 As a conductor/composer, and as a gentleman (which we knew he was), and considering the fact that he was working with the finest musicians in Germany, he knew that he couldn't blame the musicians for playing that was less expressive or less pristine than what he had in mind. He also knew from conducting the works of Beethoven and Mozart that it was possible to write music in such a way that everything could be a total pleasure for all the musicians to play. Playing through this piece from the standpoint of a violist, and keeping Mendelssohn's ideals in mind, I can understand his pain, but before playing the viola part of the piece (I have played the flute parts), I had no idea why he would feel the way he did about the Symphony, which he never published during his lifetime. It is interesting to contemplate the relationship of this Symphony to Fanny's "Das Jahr" cycle of piano music that I love so much. These few sentences from a letter that Felix from to Fanny make me wonder if he might have been inspired to write an Italian symphony by the quality of her musical impressions of her year in Rome for piano. There is something about the relationship between Felix and Fanny that makes me very sentimental. She was his older sister, and she was his very closest friend, and probably his greatest constant living musical inspiration, from very early childhood, and into their very short periods of adulthood. This is from a concert that our son Ben and his friend Claire played last night. The first song is traditional, and the second is one that they wrote together around the time of Halloween, hence the name. Needless to say, I'm very excited about this concert, which is coming up this Friday! 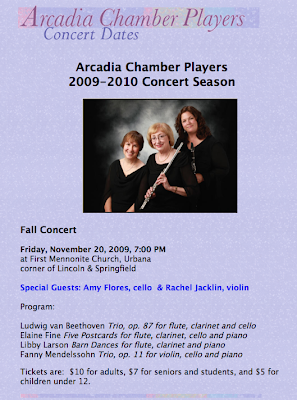 What an honor it is to have a piece on the same program as Fanny Mendelssohn, Libby Larsen, and the great 19th-century composer named Beethoven, who happens to have been a man.
. . . a few members of the audience, that is. [UPDATE] Das Jahr is no longer in the WIMA, (it is now available commercially) but there's a some other free music by Hensel in the Petrucci Library. I regularly troll around the various on-line music libraries in search of this piece or that. Lately, or at least for the past two years I have been hoping for a PDF edition of Fanny Mendelssohn's (or Fanny Hensel's) Das Jahr to pop up, and I can barely contain my excitement that the music for Das Jahr is in the Werner Icking Music Archive. The very kind person who did the computer engraving began with the month of June, which is one of my all-time favorite 19th-century piano pieces. It even sounds remarkable in a midi. I'm sending links to it to all my favorite local pianists, and sharing this "gem sighting" here. Drew McManus hit the nail squarely on the head with this. I knew Frances Shrand as the mother of my friend Joe (who was one of the original members of the cast of Zoom), and as the reader of The Wind and the Willows on a Boston-based radio program called "The Spider's Web," a program I mentioned in my last post about Brother Blue. Joe was also on the program, playing the part of the rat. I just found out that she died this past March. I also learned from her obituary that she was born in Brooklyn. I was once at a party at the Shrand house when I was a young teenager. Some of the young teenagers at the party had gotten into a bit of trouble, and Frances insisted on calling the parents of all the people who were there. When my father got the call from Frances, he practically melted. Whatever humiliating (to me) reason she called was meaningless to him. He was tickled to hear her voice--the one he knew from the radio, and admired greatly. You can listen to her (and Joe) read the The Wind and the Willows here. I suppose that I must have met Brother Blue near the beginning of his life as a public storyteller. I met him at a concert in New York, sometime in the later 1970s, somewhere downtown, in a loft. Percussionist Gordon Gottlieb and his pianist twin brother Jay invited me to their concert of improvisations with a storyteller they thought I would like. Shortly afterward I heard Brother Blue tell stories on the NPR program "The Spider's Web," (broadcast from WGBH in Boston), and it was only when I returned to Boston in 1982 or so that I actually saw him in action as a storyteller in Cambridge. There was a jazz band playing on the street in Harvard Square, and Brother Blue was there. I said hello to him, and mentioned that I met him in New York, and he took my hand and we started dancing. It was tremendous fun. He was an extraordinarily musical person, and an excellent dancer. I would encounter him from time to time, and would listen to him tell stories, usually to a rather large crowd of people, and the next time I talked with him was on a bus in Cambridge. Last summer Michael and I believe we saw him walking down Harvard Street in Brookline. He was not wearing Blue, and looked like an elderly gentleman. He even walked with a cane. 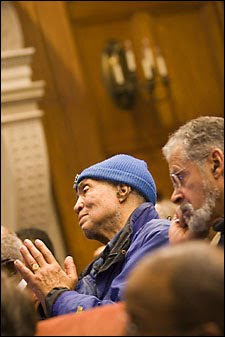 Neither of us could believe that Brother Blue could be as old as this man who walked with a cane and shared his face. But, at 87 or 88, I suppose he was. What will Cambridge do without Brother Blue? We just got a new roof. It is kind of like getting a haircut that will last for 30 years. I did the math. If I were to pay $25 for a haircut every six weeks for the next 30 years, it would cost as much as the roof. The absurd implications of this sign on this store display always make me smile. When I heard the recording of the performance we gave the other night of Cui's violin sonata, I instantly realized that the first and last movements of the piece were not worth forcing my family or my closest friends to listen to. The second movement, however, being an imitation of Tchaikovsky, is really quite nice. Anyway, had I known that Cui was such a nasty "Cuitic," I would have thought twice before putting so much effort into playing his sonata. Perhaps I was wrong to put so much stock in Cui (hoping that by working on his piece diligently enough I could make it worthwhile), but I certainly know that Cui was wrong about Rachmaninoff. 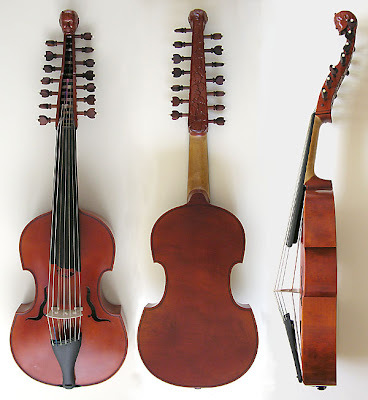 Normally the head of a viola d'amore is a blindfolded cupid. You see the occasional animal head, and the occasional un-blindfolded woman, but it is very rare that you see a male head, and even more rare to see one with horns! This instrument was made by Devin Hough for Daniel Geiger. You can see more detail here. I suppose it is every young musician's dream to have a career as a soloist: to be able to travel from city to city playing concerts, sometimes playing with orchestra, and sometimes playing recitals. I suppose that soloists are "wired" to have a certain repertoire that they play over and over again, honing and improving their interpretations from concert to concert, delving deeper and deeper into the pieces they play. It is a fulfilling (but often lonely) life for a select group of people. I am not wired that way. 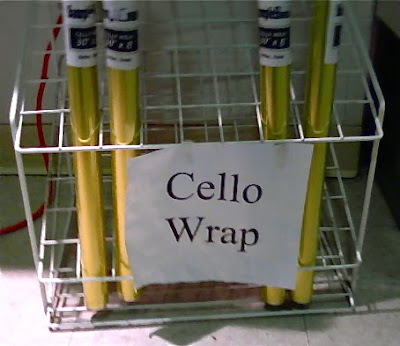 Actually, when I play a recital it is kind of like an information "dump." I work and work (and work and work) on a group of pieces, and then the performance is like a release. I do everything in my power (technically and musically) to make the experience meaningful, sometimes working for months and months to acquire the technique to play the music at hand; and then, after the concert, I am free to forget everything and move on. I can still enjoy the music while it runs through my head, or even my fingers, but I appreciate it from a distance. It is no longer my responsibility to bring it to life. Perhaps I might return to a piece or two in a number of years, but it would only be for a visit, not for a performance. There is much great music to learn and perform, and the practical lifespan of a musician is finite. There are, of course, pieces of music that I will never perform, but I practice all the time, like solo Bach, a handful of concertos, and an array of etudes and caprices. These are like members of my family, and my experience with them is extremely special and private. I prefer to be monogamous in my personal life, and to practice poly-whatever (is there a term?) in my recital playing (and, I suppose my musical life in general) than to have to endure life the other way around. Perhaps I am a musical equivalent of a Don Giovanni, and infinite possibilities await me after my evening with Bach, Bantock, and Cui. There is even space to write music now. I just discovered Tine Thing Helseth's brass ensemble called tenThing. 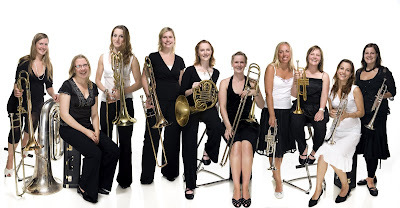 I'm thrilled that these Norwegian women are taking the brass world by storm, making it clear, once and for all, that gender isn't any kind of barrier for any instrument. It is simply remarkable how beautifully brass instruments can be played. 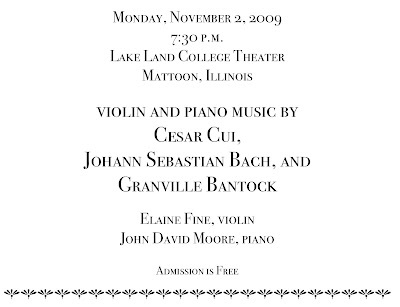 The heading of this post looks a little like the masthead of a law firm, but these people are the composers who wrote the music for a concert I am playing tomorrow night at Lake Land College in Mattoon, Illinois, to which you are invited. 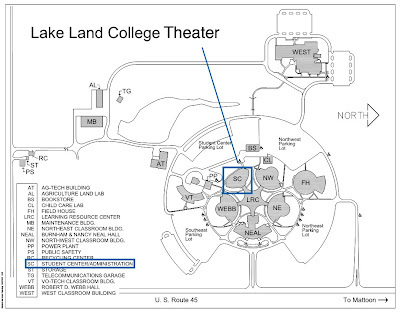 It is very easy to get to Lake Land College from I-57 (it's about an hour south of Champaign--take the Route 45 exit and turn left). Once you get on campus, look for signs for the Administration Building on the south side of the campus. Here's a map that may help.